French authorities are working hard to keep migrants either stationary and submissive or perpetually on the move in order to prevent them from coalescing into communities or forming alliances. Makeshift camps in Paris days after the closure of the Calais Jungle in October 2016. Korbi Yann/ABACA/PA Images. All rights reserved. Eight months after their eviction from the Calais jungle, migrants are still a substantial presence in the city of Calais. What has happened to them over the course of those months, however, has been largely unexplored (by those in the UK at least). To gain a better sense of what has been happening on the ground, we set up the project “Mapping the dispersal of refugees evicted from Calais” at Swansea University with funding from cherish-de.uk. Our aim is to investigate how migrants’ lives – both on and off the move – are controlled and governed away from the ‘border spectacle’ and declared 'humanitarian emergencies' that receive so much attention in the press. During his official visit to Calais in early June, the French minister of the interior Gerard Collomb announced that 150 additional policemen will be sent there, in order to avoid that “Calais and Dunkerque become places of fixation for the migrants and that other jungles could multiply” on the territory. His words suggest that informal migrant encampments are growing, or have the potential to do so, and that the French authorities are pursuing a strategy of dispersal and division to prevent such camps from coalescing into autonomous spaces like the Calais Jungle. The European context is characterised by a widespread criminalisation of migrant intra-European movements on the one hand, and refugee support activities on the other. June 4, 5:56 p.m.: about 30 policemen positioned on the edge of a field in Calais' industrial periphery prevent dozens of young Afghans, Eritreans, Sudanese and Iraqis from entering. When the clock reaches 6 p.m., the police stand aside and the migrants enter: they have two hours to recharge their phones using a power generator brought there by a Calais resident; to eat the food cooked by the activists of the Calais Solidarity Kitchen; and to stock up on clothes from the local organisation Auberge des Migrants. At 8 p.m., the police return and hamper activists and locals from distributing further food and material support. There is a larger effort to criminalise solidarity and prevent alliances from forming between migrants and non-migrants. This happens in Calais on a daily basis, even after the Court of Lille suspended a municipal decree forbidding food distribution on 22 March. That decree, however, is emblematic of a larger effort to criminalise solidarity and prevent alliances from forming between migrants and non-migrants, especially those opposing state policies that make migrants illegal and vulnerable. The main tactic used by the French authorities in this project has been to take migrants’ terrain away from them, both in terms of rights and in terms of actual ground – their spaces of existence as well as their spaces of movement. This is not a subtle project, and it includes actions like throwing pepper spray at night into the water that migrants drink and onto their clothes. It also includes preventing them from dwelling in the cities, and after the Jungle was closed migrants were shifted to temporary ‘centres of hosting and orientation’ (CAOs) before being transferred elsewhere. No official list of these centres has been released, although NGOs estimate that there are currently more than 500. Finally, taking terrain away takes place by indirectly fostering migrants’ ‘rate of evaporation’, a term which refers to migrants’ flights from hosting centres as well as from informal camps situated in urban contexts. Invisibilising migrants in critical border zones does not necessarily mean getting rid of their physical presence. Yet, the two strategies – making migrants invisible and pushing them to escape – partially converge in the circuits of the hosting system, whereby those who enter it become manageable and those who don’t become criminalised. Migrants’ refusals to stay into the French hosting system often depend on their acceptance of not claiming asylum in France, or in many cases are fleeing tactics to avoid forced transfers based on the Dublin Regulation or deportations to their countries of origin. This demarcation line, between those who accept the conditions of the hosting system and those who do not, is found elsewhere in Europe. The establishment of material and juridical obstacles for those who claim asylum but then escape hosting centres is widespread, and one effect of this is to promote the ‘evaporation’ of unruly migrants to somewhere else. Those who do not accept the spatial restrictions imposed by the French hosting system are also deprived of the daily pocket money – €6.80 delivered by the Office of Immigration and Integration (OFII). Since January 2017 the money has been made available through debit cards that asylum seekers are obliged to use for taking cash. The implementation of a debit card system can potentially be used for tracking migrants’ transactions. It also further disciplines refugees’ conduct: asylum seekers can take cash from ATM machines only three times per month, and the cash that is not withdrawn at the end of the month is taken back by OFII. The hosting centre in Paris at Porte de la Chapelle – renamed the “humanitarian bubble” by NGOs and migrants due to its shape – opened in November 2016. A representative for the cooperative that runs the centre, Emmaus Solidarité, described it to me as a “bubble for unconditional hosting”, because it “works as a place that hosts all migrant populations, irrespective of their nationality”. 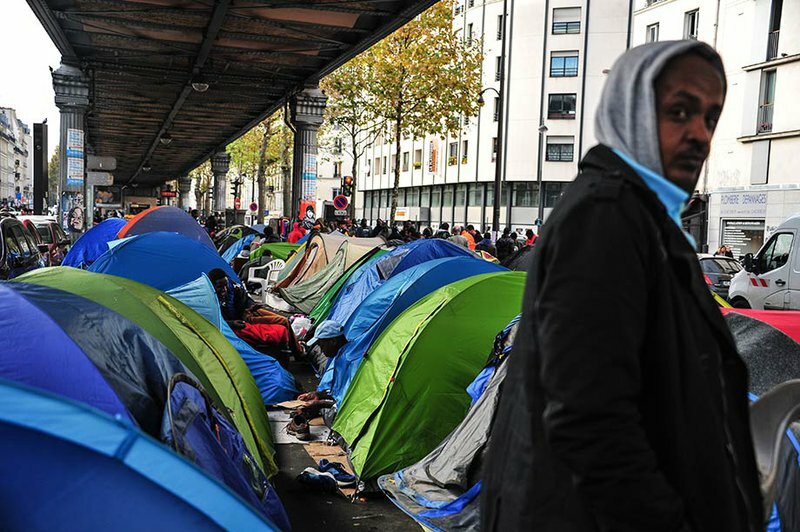 The centre has been built to regain control over migrants in Paris, giving them temporary accommodation in order to prevent them from begging in the capital or building informal camps. In order to avoid the use of the bubble as a transit point, migrants are not allowed to stay at the hosting centre more than once. As a centre of identification, sorting and channelling, can the “humanitarian bubble” be defined as the French hotspot? Once inside the “bubble”, migrants are quickly requested to go to the Ministry of the Interior to be fingerprinted, often only after a couple of days. The fingerprints are checked in the EURODAC database in order to verify if they had already left their biometric traces in another member state. The Calais Jungle will never end. Migrants who fall under the Dublin Regulation are increasingly sent back to the member state responsible of their asylum application. This clearly emerges from a report published by the French organisation LaCimade, which shows an increase of about 26% in 2016 of migrants transferred by force to Italy, Germany and Norway, despite a temporary suspension of the Dublin Regulation for migrants living in Calais that was instituted at the time of demolition in late October 2016. Moreover, at the time of the eviction, both migrants who wanted to claim asylum in France and those who did not were transferred to CAOs across France, under the rubric of a “mise à l’abri” strategy – literally “giving a shelter”. For a few months CAOs worked as hosting places for all those taken from Calais and Paris, independently of their will to claim asylum. Today, migrants entering Porte de la Chapelle are requested upfront to declare whether or not they want to claim asylum in France. The former are transferred to a CAO while the latter are forced to undertake errant geographies or are forcibly transferred to another EU state on the basis of the Dublin Regulation. This ‘choice’ is presented as part of a strict cooperation between national authorities and humanitarian actors, and has the effect of convincing migrants to move to CAOs in order to not be returned to Italy. We can speak of expulsions of humanitarianism to point to the effects of forced mobility and displacement caused by the exclusionary measures of the asylum politics, as well as to forced transfers made on the basis of the Dublin Regulation. This also takes place when police raid and evict informal camps and spaces of refuge. Such evictions and ‘choices’ are given a humanitarian veneer by the NGO actors in the area, who call such evictions “mise à l’abri” because, as the Emmaus Solidarité representative explained to me, “it is an eviction that is conducted for the benefit of migrants, that is for transferring them into the circuits of the hosting system”. Within an asylum regime that does not contemplate the presence of ‘migrants in transit’ at either the juridical or political levels, eight months after the eviction of the Calais Jungle migrants are subject to two complementary and to some extent inverse spatial strategies of control. The first is a politics of dispersal deployed to prevent and neutralise the formation of autonomous migrant camps, dividing up and separating migrants from one another. The second contains, constrains, and directs the mobility of those migrants accepting to stay within the asylum system, and that of those excluded from it. “The Calais Jungle will never end”: this sentence pronounced by a citizen of Calais can be reiterated well into the French and European interior. Migrant zones of transit and refuge punctuate the European space and recursively re-emerge, showing us a moving cartography to be traced. These informal areas are often so small and temporary that they are easily seen as irrelevant. Just small groups of migrants, constantly under eviction and invisible on the geopolitical maps of Europe. They are, nevertheless, important places to remember, as they draw a map of how the European border regime is constantly reconfiguring itself in response to migrants’ presence. The increasing criminalisation of practices of active solidarity in support of refugees and migrants is the index of much wider disqualification of transversal alliances, ones which narrow the differences between migrants and non-migrants and which oppose the vulnerabilisation and illegalisation of some people that is produced by state policies. In a nutshell, in Calais, measures are aimed at taking the migrants’ terrain away from them.